Warmoth's photography is exceptional, so I'm going to just use their photos. You can click on either of these for a close up view in a new window. 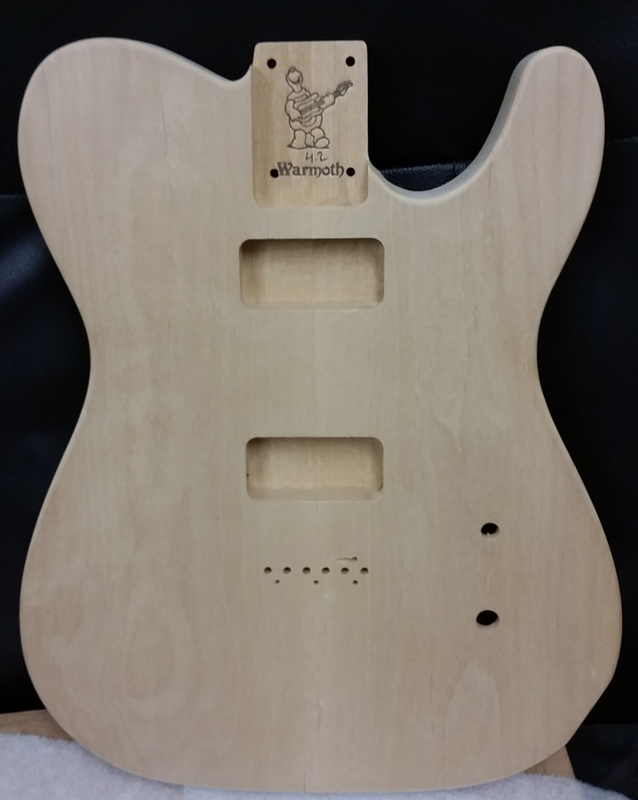 We are going to first sand the guitar a bit, to get it down to 100% finish ready. We don't want to sand after it is aged if possible. Once again, I will be using my trusty Rig #1, with six lamps overhead (Solacure SG-1-40 FR40T12 lamps) running at 80 watts each of high frequency ballast (about the same as 100w of regular ballast). I will fill in the sides with an off the shelf F40T12 fixture, so they will have only 40 watts each, and I may need to do some tricks to even it out. I will use the same lamp, the SG-1-40. Aging doesn't happen in an hour, so it is easy to even out stuff like this. 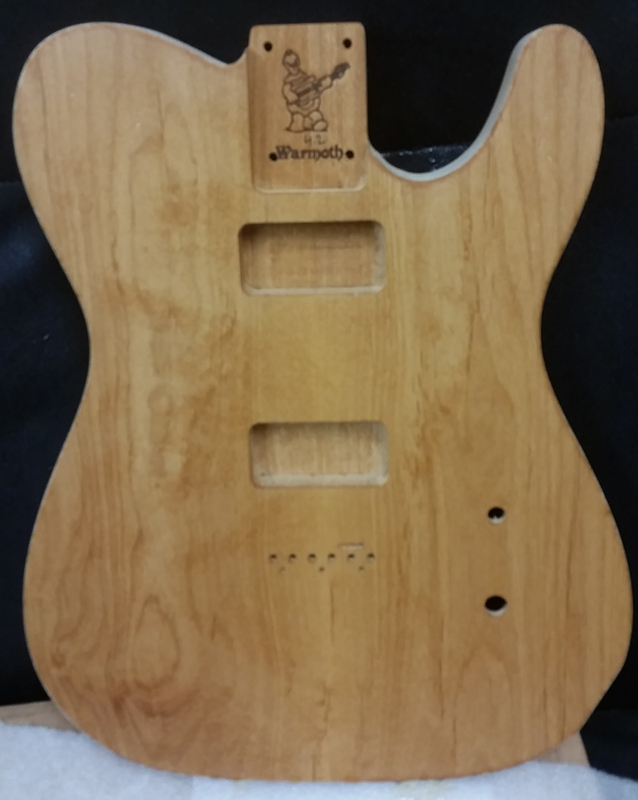 The body will have NO fillers, no sealers, just raw wood, finish sanded, then dampened and resanded to remove the little fibers. I expect we will need to sand just a little after again. Haven't decided what to do here. 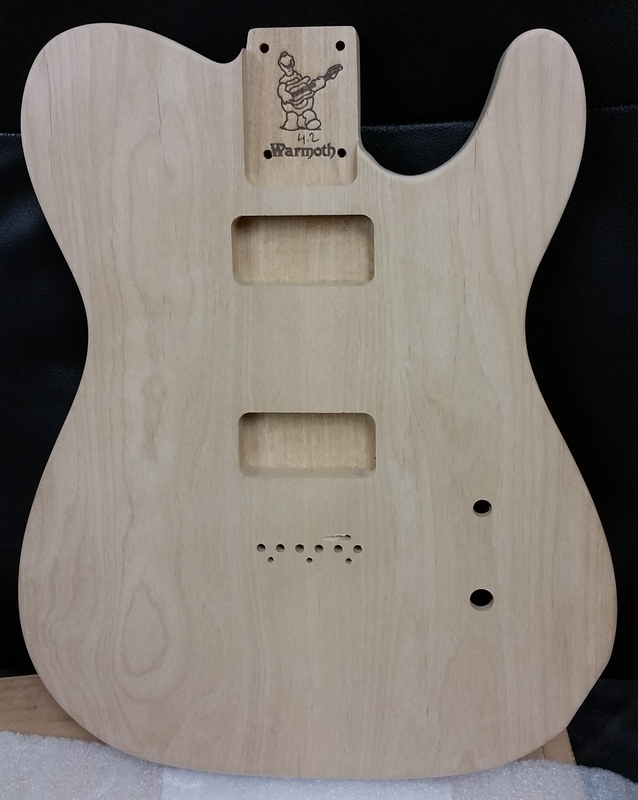 I have some white pickling finish, but that is really for swamp ash. I have some red stain that looks similar to the old Gibson SG finish, and a very thin coat of that might tempt me. We will see after the aging. I picked up a pair of Fender Fidelitron pickups the other day. I've used TV Jones and Fidelitron pickups in different guitars, I love both and honestly, I don't see TV Jones as better as much as just very different. Fidelitrons are brighter and more single coil sounding to my ear, and less than half the price, so that is how we will go. Pot and switch are Fender/CTS and I think I have an old vintage style hardtail Strat bridge that will mount directly up. 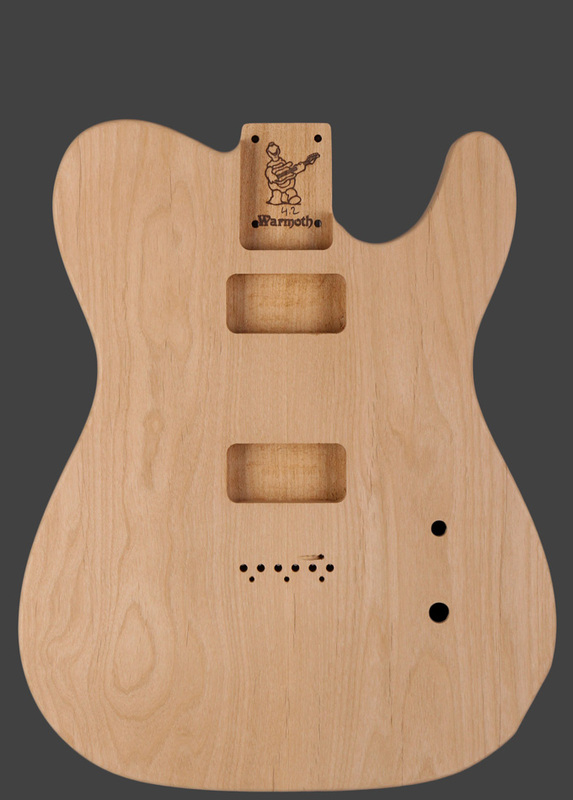 Haven't decided on the neck yet. This will get updated, of course. Right out of the box. Looks a bit more bleach blonde than their photos, and there are a lot of grain imperfections that would normally make this a paint grade body, but we will call them character and plan to still go forward with the red stain. Overall quality is quite high, as I would expect from Warmoth. Needs some final sanding, and I might round the edges just a little extra. Click for a higher resolution versions. The two images below is of the face of the guitar after 50 hours of aging. To the naked eye, it doesn't seem like alder ages as rapidly as ash or maple (both age very quickly), and ages more like pine, which is slow and steady. The second image is after I misted the body with water, both to rehydrate it, and to show what it would look like with a clear finish. I used my camera phone for these, which might have been a mistake, as the clarity isn't that great and it doesn't show the aging very well. Even flipping from front to back, I can see a difference is the tone of the wood, the camera just doesn't show it very well. Not dramatic, and not as stark as I would like, but there is a mild to moderate difference. We may try more UV after the stain is applied. By the time we get to 2 days of aging, I usually have a good idea what to expect. The alder is aging some, but not overly so. Perhaps it is due to the wood having darker tone to begin with. 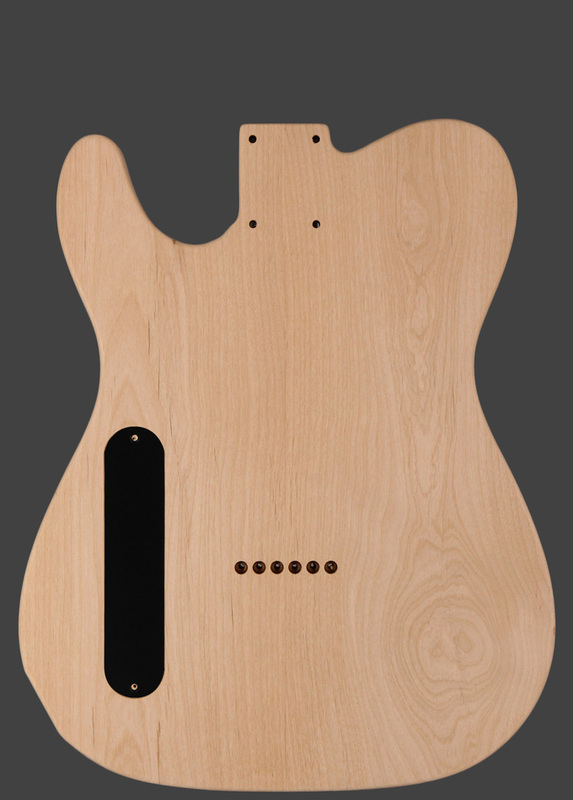 I could keep going, but it is obvious you won't get a super dark finish with alder. I've matched up dark and light alder before (see other projects with a non-bookmatched body) but even then, alder simply isn't a wood that is going to age much, sun or UV lights. Next I'm going to throw some Minwax "Sedona Red 222" on it and age it more after a few coats. This is how we learn. This is an oil based penetrating stain, readily available at Home Depot, Lowes or online, so it isn't a specialty product. This image is after a single moderate application. 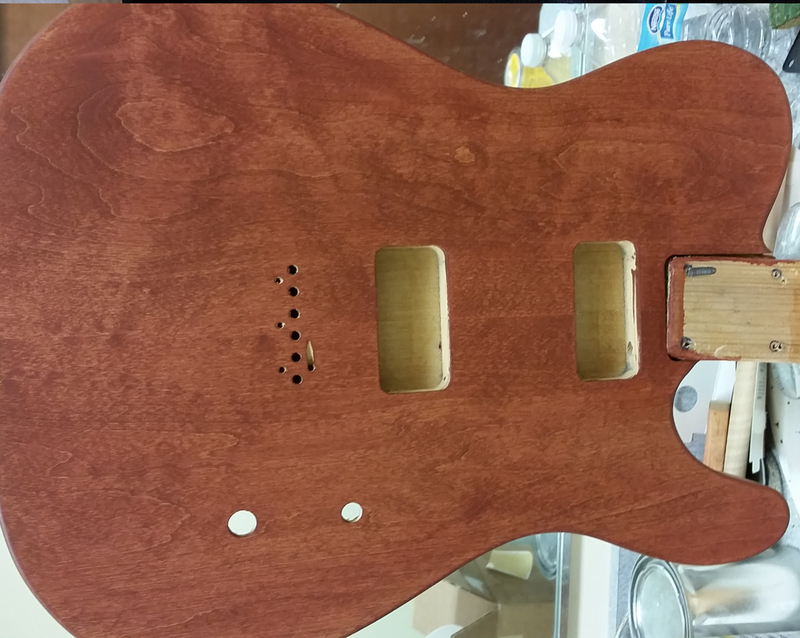 The body really is a "paint grade" body, rather than stain grade, but the red is dark enough to hide some imperfections, and frankly, I like a barncaster / rough look to my guitars anyway; almost all mine are wood toned in one way or another. After three coats of red oil based stain (four coats on the edges), I am exposing the wood for about a day or two, to help dry out the oil. This is the same thing that violin makers do, except they do it with linseed oil based finishes. This should rapidly speed up the curing process on the oil itself. 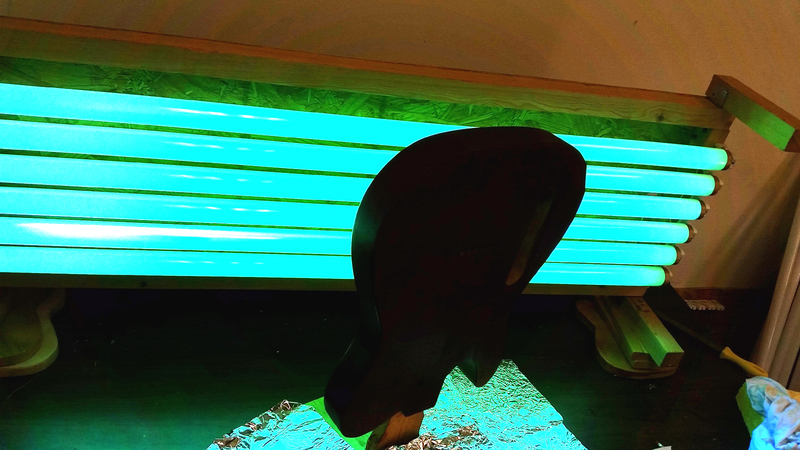 This is very different than curing UV resins, but it still speeds up the process for oil stains and lacquer if you expose it to UV. It can reduce a full cure from 2 weeks to 2 days. Anyway, you can see I'm at an angle, and will do this for all the sides for most of a day each. This can also age the wood a bit, grey or brown tones. We will see. Here you see I make a T stand for holding the guitar, nothing fancy at all.